We have had beautiful weather in London since I arrived in the UK on August 4. But today with the protest about to kick off it's tipping down. I'm in my hired car and "luckily" I get a puncture right outside BBC television center on Wood Lane. With no parking in the area, this gives me 90 minutes for the road side rescue to come and change my tire without getting towed. With hazmat suits, large signs and flyers to drop off, this makes life much easier. First on site with me is Tom Chance, Green Party spokesperson on Free Software. He has organized for Dr Derek Wall, lead spokesperson for the Green Party to join us and make some statements about BBC iPlayer and the Microsoft lock-in it establishes. 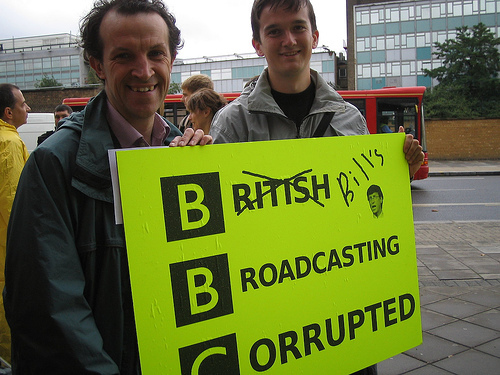 A final count shows we had twenty at the London protest and ten at BBC Manchester. BBC security and then the police pay a visit. They are interested in hearing about the iPlayer and Microsoft and they take fliers away with them. Then we get down to business and start marching and chanting. This is a great location for our protest. We start outside BBC TV Centre and then move to BBC Worldwide a 1/4 of a mile away. This is where the iPlayer development team are based. We have a large audience of BBC staff come to the windows to wave and watch us. A few start to open windows and then a few more. We get supportive shouts and smiles. One staff member starts to put apples on the outside of the window frame - a message about Mac development maybe? Anyway, an executive comes out of the building and shouts up to all the staff to get back inside and close their windows. We jeer in appreciation. A break away group of protesters then head into BBC White City to track down a BBC executive, to come out and address the protesters and answer some questions. Later we find out that these requests are refused, and no BBC spokesperson will speak with us. Below are some photos from the action. Thanks to everyone that came along. 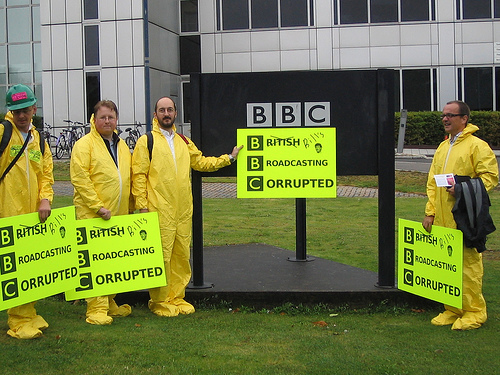 We had lots of fun and sent an important message to the BBC executives responsible for this DRM mess.